Vehicle Tracking Market size is estimated to surpass USD 11 billion by 2024; according to a new research report by Global Market Insights, Inc.
Increasing vehicle security concerns, especially in corporate sector will primarily drive the industry growth over the forecast timeframe. Rising need to monitor the vehicle movement for goods and passenger security will further escalate the revenue generation. Integration of information technology and telecommunications has introduced next generation advanced solutions in various sectors, offering enhanced rapid deliveries with precision, inducing immense potential to the market size from 2017 to 2024. Heavy commercial vehicles are anticipated to witness growth at over 12% from 2017 to 2024 owing to rising demand for transportation of passengers & goods along with increasing construction activities. Vehicle tracking market from light commercial vehicles will account for a significant share over the forecast timeframe owing to rising transportation of light weight goods. Increasing domestic and international courier services will further propel the industry growth. Increasing implementation of these devices by transportation service providers for ensuring fast transportation of goods has resulted in high demand for GPS tracking, positively impacting the industry size. Various countries are mandating stringent norms for usage and installation of fleet monitoring devices owing to rising vehicle theft incidences in countries including Russia and Brazil. For instance, Brazilian government mandated the installation of anti-theft device in all the vehicles produced and imported in the country. These devices will be capable of tracking the vehicle at every moment. These regulations are likely to offer stable growth prospects to the vehicle tracking market share over the forecast timeline. Provision of several benefits such as cost reduction, driver & vehicle safety, enhanced customer service, time management, and better life cycle management will further drive the industry growth over the forecast timeframe. Moreover, rising demand of luxury and premium vehicles, especially in developed countries across the globe will propel the revenue generation. However, invasion of privacy is a key factor negatively impacting the industry growth. Excessive costs associated with their installation in the vehicles may also pose a challenge before the vehicle tracking market participants. Vehicle tracking market from wired devices is estimated to cross 92% volume share by 2024. Substantial revenue generation can be attributed to their high deployment in vehicles and provision of the advantages. Regular technological advancements such as enhanced satellite view and mobile tracking are pushing the customers to increasingly adopt these devices. Wireless product segment is anticipated to grow significantly owing to their easy portability and compact size. Vehicle tracking market from active devices will exhibit highest volume share over the next eight years owing to provision of benefits such as automatic reassignment, accuracy in delivery time information, and versatility in networks. Passive technology is likely to grow till 2024 owing to its quick and easy installation. Fleet management will grow substantially from 2017 to 2024. This can be attributed to provision of the benefits such as customer satisfaction, fuel monitoring and speed detection, real-time monitoring, and maximizing vehicle utilization. Vehicle tracking market from cargo logistics will grow owing to advancements in mobile technology. These advanced devices allow continuous two-way communication with the fleet. Cost effectiveness as compared to the other counterparts will further escalate the revenue generation till 2024. 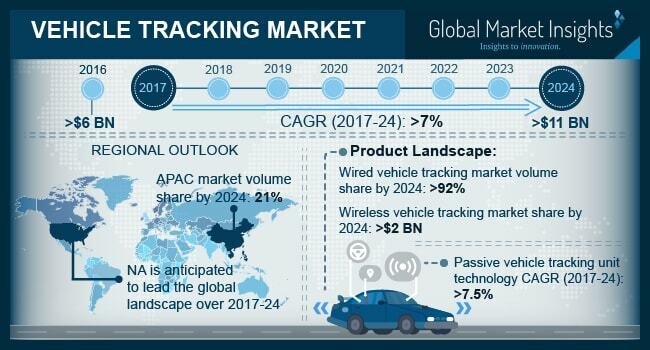 North America vehicle tracking market is anticipated to capture the highest volume share over the next eight years. Presence of key automobile manufacturers along with technology providers across the region will primarily contribute to the revenue generation. Various regulatory authorities such as Federal Motor Carrier Safety Administration (FMCSA) are mandating the installation of these devices in vehicles, further supporting the regional dominance. Asia Pacific will also account for a significant share in the global market owing to the substantial automobile production coupled with stringent regulations, especially in developing countries. Fleetistics, Calamp, Maestro Wireless Solutions Ltd, Navotar, Garmin, and Mio are among the prominent participants in the vehicle tracking industry. The competitors are focusing on increasing the product penetration across the globe. They are increasingly partnering with online distributors such as Amazon, eBay, TrackMe, GPS-Track, etc. to enhance their visibility. This has led to the high growth of these online channels.